The Dubai International Boat Show lived up to its reputation, stirring huge interest among the yachting community and notching up sales of around $50 million by the time it ended. More than 430 boats and over 800 exhibiting companies and brands from over 54 countries saw both debutants and long-term exhibitors seeking significant Return of Investment (ROI) and business opportunities during the first days of the show. A total of 26,000 local and international visitors had descended on this year’s show, said the event organisers. UAE-based Al Shaali Marine, which unveiled the AS 100 superyacht this year, valued at $5.45 million, was expecting to sell at least three superyachts and seven medium-sized boats with more leads expected to convert in the next few weeks. “We know that Dubai International Boat Show draws serious buyers, and this year has been no exception. Not only are we expecting to sell superyachts and boats, but we’ve also inked three dealership agreements – one regionally and two in Europe – to supply our high quality, UAE-manufactured luxury yachts to even more buyers,” remarked Sultan Al Shaali, the group CEO. The new and deluxe 77 Enclosed Flybridge from Riviera, touted as the largest, most luxurious and most technologically-advanced Riviera ever and unveiled to the Middle East for the first time at the show, was sold on Day Four through its exclusive regional distributor, SF Yachts. On the same day, local 360-degree leisure marine company ART Marine reported the sale of the luxury Italian-made Fiart 47, worth $876,968. San Lorenzo Middle East, represented by ACE Marine, also confirmed the sale of their 26.45m SL 86, worth $8.3 million in the first three days of the show with serious prospects expected to convert to sales in the coming days. “It has been a very productive boat show with great results so far, and has given us the exposure we are expecting. There has been a constant flow of very serious, high networth prospects from the UAE and GCC countries, and we are already looking forward to the next boat show,” remarked Tarek A Khalil, managing director of ACE Marine. Sunreef Yachts, a manufacturer of luxury sailing and power catamarans and superyachts from 60 to 200 ft, also witnessed strong interest in their 70 foot Damrak II luxury power catamaran. 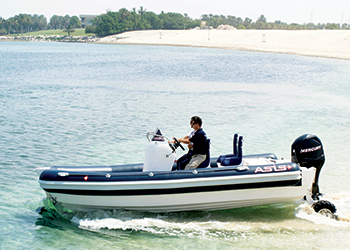 ASIS Boats, a UAE-based manufacturer and designer of rigid inflatable boats, showcased its Outboard Amphibious Boat at the Dubai International Boat Show. The company specialises in supplying leisure, commercial and military customers. Offering a new level in convenience, safety and agility, the 7.1 m high-performance, high-capacity Outboard Amphibious Boat enables owners to singlehandedly move from land to water and back to land without the need for a ramp, thanks to its Sealegs amphibious system with motorised, retractable and steerable wheels. The boat can be powered by up to 200 hp outboard engines and is capable of speeds up to 45 mph (72 km/h), according to a statement. “Like the ASIS Inboard Amphibious boat, which enjoyed its global launch earlier in last year’s show, ASIS Outboard Amphibious boat brings the latest military technology to the leisure and recreational marine market to create a craft that is capable of exceptional performance, but is also easy to operate and safe for both operator and passengers. “The design of the ASIS craft ensures uncompromising comfort and safety for passengers, easy communication for all thanks to its wireless communications system, and a 30 per cent reduction in fuel consumption compared to other similar boats.